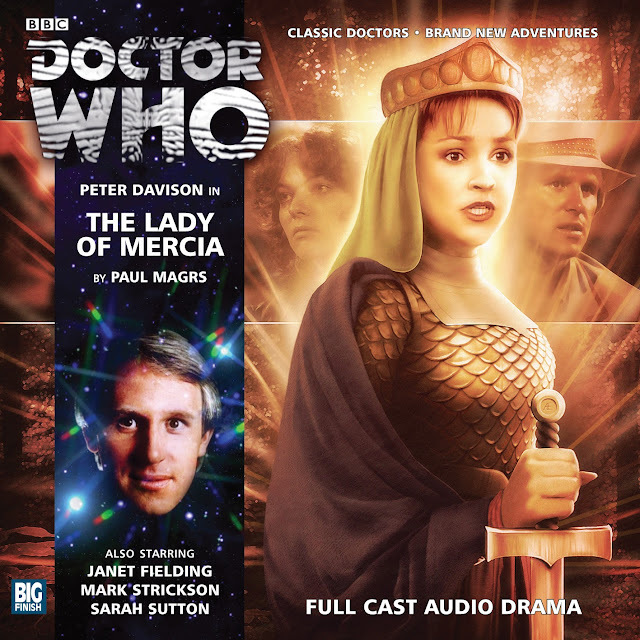 The Fifth Doctor and crew return for a semi-historical adventure. In 1983, students protest the defunding of the Humanities department. The Fifth Doctor, Turlough, Teagan, and Nyssa are mistaken for visiting professors and invited to a conference on ancient warrior queens. The Doctor sets Teagan up as a visiting Australian professor after a snarky comment. While hobnobbing, Teagan and Turlough see one of the professors stealing an ancient sword. They track it back to a lab where the professor puts it into the machine. Soon, Teagan and the Professor are in Aethelfrid's castle in 918. This story is a delightful romp through time. Unlike the last one, this adventure has a great cast of supporting characters that are essential to the plot. The idea of a time machine being built in 1983 seems a bit preposterous, but Back to the Future is set in 1985, so maybe not. Dr. Teagan Jovanka? Now that's funny! Almost as funny as Sister Teagan. To be fair, this is a great Teagan tale. She's taken under the wing of a warrior queen and actually develops a snarky rapport with her. This mother-daughter relationship softens Teagan and even forces her to do some courageous things in defense of the warrior queen. The Fifth Doctor has brought the Tardis team to 1983 specifically to deal with the time machine. He gets distracted by Dr. Bleak's party. For any other Doctor hobnobbing with historians would seem out of character, but it is quite natural for the Fifth. His reluctance to show Dr. Stone his time machine is a bit paranoid. Does he think she's going to get ideas? Turlough may have gotten some during this adventure. That's saying quite a bit as he doesn't do much but brawl with a student and help repair the 1983 time machine. Dr. Phillipa Stone is the inventor of the 1983 time machine. She is hiding something incredibly unsurprising from her husband, and it's not the time machine. That aspect of their relationship strains credulity a bit, but a historian would definitely stay with a physicist if they were inventing a time machine. Dr. John Bleak is a historian who's been secretly funneling money into his wife's time machine. He then commits the incredibly stupid act of stealing a sword and getting himself set back in time. He's a bumbling coward whose cowardice borders on pessimism some of the time, but he never gets irritating. Princess Aelfwynn gets a ride forward in time and the results are unfortunately as one might think. She slashes her way and and attacks some students. The doctor talking her down and her realization of her place in history are some of the finest bits of the story, though. Between protesting students in 1983 and warring states in 918, there is quite a bit to listen to. The setting of each time is distinctive and rich, so the travel between the two flows well. The moral of this story is somewhat similar to the Aztecs. The doctor must maintain the timeline while saving Teagan and Dr. Bleak. Connected timelines with delightful characters make this adventure fantastic. The way the 1983 time machine works may leave a few questions, but it suits the story. There is also plenty of comedy that floats through this story, and it isn't limited to imagining Teagan in funny outfits. This might just be the best Teagan story ever; plus, it's a fantastic Fifth Doctor tale.